Just before dawn all is blue: I barely see the lark bunting light on a fence post. I stop to admire its white, plump breast, and for a moment the two of us are alone in this world, and at peace. The bunting flies away: white on black on white on black. After working the day at the bookshop a few weeks ago, I pulled into the long driveway of our old 1860s farmhouse about thirty miles outside town. The light had started to go that dusky blue-gray, turning the hills around us the ruddy red of new buds. I stepped out of my car and a wave of noise came at me from the swamp just beyond a stand of trees in front of our house. This time of year, the northern green frogs are so insistent, so loud, like the twang of thousands of rubberbands snapping, snapping, snapping, and the bullfrogs and peepers complete the chorus. 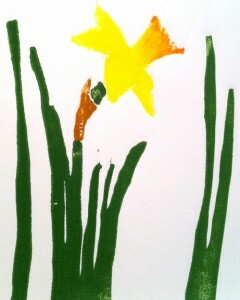 It is eerie, and it is wonderful, and up here in northeast Pennsylvania it is our signal that spring has begun. 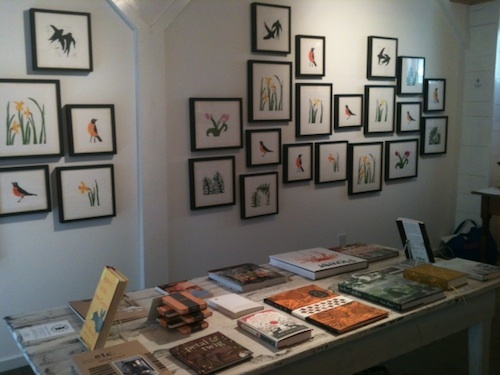 Our little collective of shops at Maude Alley also burst into spring this month in its own way. Named for one of the owner’s grandmothers, the alley reminds me of the kind of meandering wooden walkways you find at the beach, but instead of winding toward the ocean ours ends in a sweet secret garden along with a cheese shop, a gallery, and us. On either side of the alley is Milkweed, our anchor store, whose fanciful window displays alone are worth the trip. Hoping to catapult us far from the long winter, the Maude Alley shops decided to throw a party. When Mark and I lived in the city, we threw crazy cocktail parties in his painting studio down on Great Jones Street. We’d buy cases of pinot noir and chardonnay from Astor Wines up the block and drag bulging bags full of Camembert, manchego, and pecorino from Murray’s Cheese Shop on Bleecker. Filmmakers and hairdressers and painters smoked on the fire escape, uptown collectors mixed with writers from Brooklyn, burlesque dancers bartended and choreographers gulped whisky with bankers, and usually at some point in the party I would lock eyes with Mark across the room and worry the crush of people was about to get out of hand, though it never did. We didn’t expect this kind of crowd at our first Moody Road Studios party. Honesdale will never be New York City, and that’s simultaneously heartbreaking and a relief. But we did want to throw a great bash, as much for the shop’s health as for ours. The party, which we decided to call Spring Fever, would help break up the ice of the winter and set the tone for the months to come. So Mark took to the presses in the barn and worked up a collection of new prints in bright colors. Up till now, except for a few red valentines, he’d only shown black and white woodcuts. He hung the new collection the day before the party and when I came into the shop I couldn’t stop smiling: lemon-yellow daffodils with soft brown husks hanging around their necks like cowls, cadmium-orange birds, even candy-pink tulips! He nailed the exact bright new green color of the fern in our forest the first weeks after they unfurl. Blacks arcs of barn swallows swept above his installation, looking the same way they do when I stare up at them in the sky, backlit by the sun. The day of the party, instead of books our big farm table that runs down the middle of our space held wine, clear plastic cups, and a galvanized tub of ice. 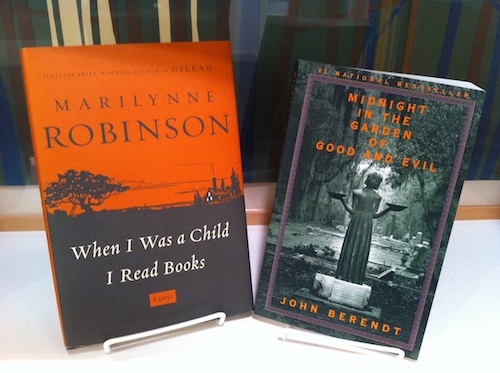 I tried to make the covers of the featured books on the shelves spark off the prints—the electric orange of John Berendt’s Midnight in the Garden of Good and Evil and Marilynne Robinson’s When I Was a Child I Read Books, the yellow shock of Karen Russell’s Vampires in the Lemon Grove. As we worried our table was looking a bit bare with just wine, our Maude Alley neighbor, Calkins Cabinet, surprised us with a tasting platter of gorgeous farmstead artisinal cheeses from a local creamery. I suddenly didn’t miss slogging those Murray’s bags across town so much. Meanwhile, the back gallery space was transformed into an enchanted forest by our friend, the artist Laura McManus, whose North Woods series was inspired by the lake that’s been in her husband’s family for generations. 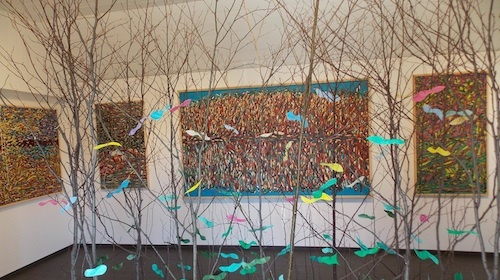 The paintings are like music, all movement, and Laura and her husband, Jim, built a stand of real trees into the middle of the space. I felt as if I was both seeing the landscape through her eyes and magically stepping inside one of her paintings at the same time. She’d put out a punch bowl and homemade cookies and each time I went back to her space to say hello she was too swarmed by admirers to talk. I led my smallest son through the garden paths on his shaky new legs as crowds of people weaved through all the shops, chatting happily, excited about the art and sunshine. We sold half of the prints on the wall and people stood around the shop, balancing books and cups of wine in their hands. For Moody Road Studios, the party was an experiment, a harbinger of spring and the close of a cold, tough season. It wasn’t New York, but it was so lovely. And by the end of the night, our winter spending freeze officially started to thaw. Our shelf space is, of course, limited, which is part of the shop’s charm. 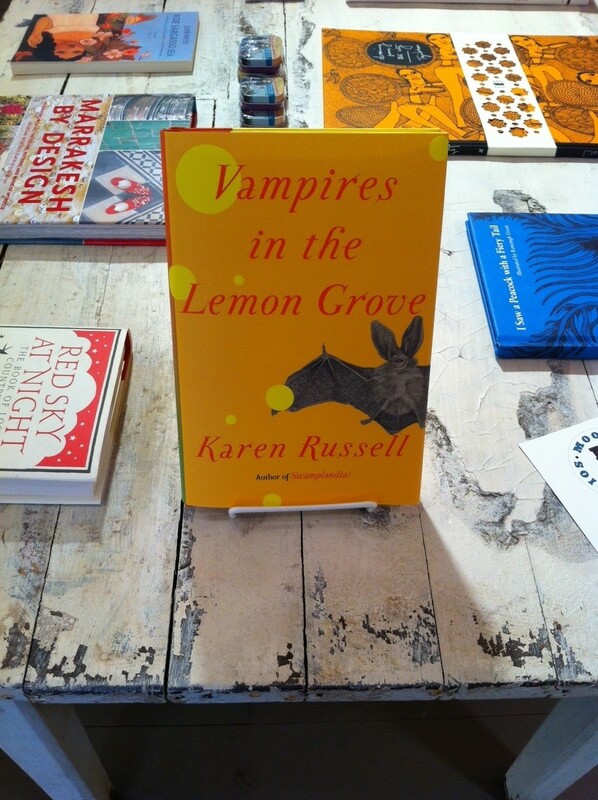 I’ve read more than 85 percent of the titles in the shop and I live to recommend a person’s next favorite book. I never truly understood the term “hand-selling” before Moody Road Studios, and I love the challenge of finding the right book for someone. I knew I needed to restock some of our old favorites—I’ve been selling a lot of Abigail Thomas (both Safekeeping and A Three Dog Life), and Dakota, by Kathleen Norris, is another life-changing book I like to put in people’s hands. Our first reading series night is coming up on May 11 with Domenica Ruta (With or Without You), Owen King (Double Feature), and Mason Currey (Daily Rituals: How Artists Work), and I needed to stock up on those titles, too. But what else to call in for April? Wake up in the morning but don’t get out of bed. D. had sent it to me after we broke up—four years after we’d split, more than fifteen years ago now. What I’d completely forgotten was that he’d read the book first and made notes throughout, some as simple as, “I like this” or “For Luke,” a professor we’d had a class with together at Vassar. In the poem “Still Life” he’d simply underlined the word berries. The last poem, “Looking at Them Asleep,” about a mother watching her children in bed, is one I’d never paid attention to when I was reading these in my teens and twenties, but seeing D.’s note I revisited it. Beneath it D. had written: Although I’ve put little notes here and there they aren’t silly notes. 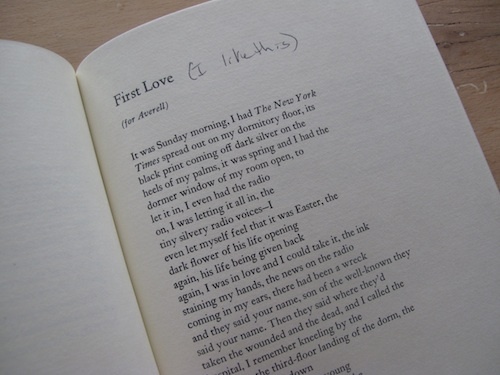 I think some of these poems are wonderful … this one made me cry. We both have two sons now. On this reading, “Looking At Them Asleep” eclipsed “The Girl” as my long-time favorite of the collection. My own children were asleep upstairs and I tucked the book back into its place, the burgundy and gold cover dusky from fifteen years of being boxed and unboxed through multiple moves, slid onto and off of various bookshelves. A distant cousin recently sent me a package of old photos in the mail. She’d been searching listings of her local rural auction house in Vermont and recognized an estate as my grandmother’s sister’s, my great-aunt Liz, who’d recently taken ill and relocated to California to be closer to her son. Apparently she’d left her ancient farmhouse in foreclosure and they’d planned to auction whatever furniture hadn’t been ravaged by her incontinent dog and resident family of raccoons. Liz had been a model (her face had once plastered subway cars as a Rhinegold Girl) and a painter, an eccentric who’d buried the ashes of her second husband (of four) between two trees in her side yard. 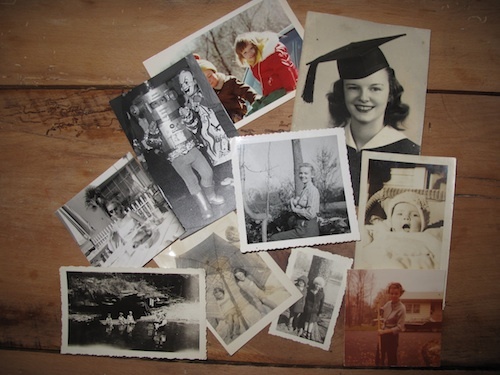 When the auctioneer realized my cousin knew Liz, he delivered the package of photos into her hands. They were of no value to anyone and had been sent to the Dumpster, where, against policy, he fished them out. Inside were some of Liz’s old model pictures, images of her and my Nana as girls, a snap of myself at my oldest son’s age, three, maybe four years old. I traced the handwriting on the back of a baby picture of my own father, imagining the pen making loops in my grandmother’s hand. I understand that these pictures will likely end up back in a Dumpster eventually. My copy of The Gold Cell will also have an unglamorous end one day, chucked in some burn pile, just some musty paperback. The electronic versions of these have a greater shot at longevity—if D. had clicked his cursor and typed his notes there would be a permanent, searchable record, a clutter of electronic footnotes in some e-book file that would surely last forever. But I wouldn’t, fifteen years later, be able to look at his handwriting, feel that shock of recognition. And I wouldn’t be able to see where the pages naturally fall open and tell which poems I’d reread the most (“The Girl and The Blue Dress”). A clutch of papers glued and bound will never have the indelibility, the agility of an e-book. Just as Honesdale can never hope to have the electric force of New York City, but we were still able to throw a crazy cocktail party with books and art, amazing cheese, a beautiful group of friends and customers, and even an enchanted forest. Sitting in my husband’s old wooden rocking desk chair at the shop this month, I’ve taken to staring at the swallows flying above the other prints in the shop, thinking of old sailor tattoos and how often these were the first birds to appear out at sea as ships got closer to land, helping the men find their way home. I think about the power and beauty of ink on paper, not just in books, but in the process of Mark carving these shapes into wooden blocks and rolling them through his old press in the barn until his elbows ached, while real swallows fluttered up in the beams above him. The idea that these words, these images, are at once so imperial and permanent and yet so vulnerable reminds me of the birds themselves, fearlessly darting and dive-bombing the sun glinting off the windowpane one moment, impossibly still and dead on the barn floor the next, all tiny bones and wings. There is magic in that vulnerability. Kelly McMasters is a writer living in northeast Pennsylvania. Her book, Welcome to Shirley: A Memoir from an Atomic Town, inspired the documentary The Atomic States of America, a Sundance 2012 selection. Her essays, reviews and articles have appeared in the New York Times, the Washington Post Magazine, Newsday, River Teeth<em,> and Tin House, among others, and her next essay is forthcoming in the March issue of The American Scholar. 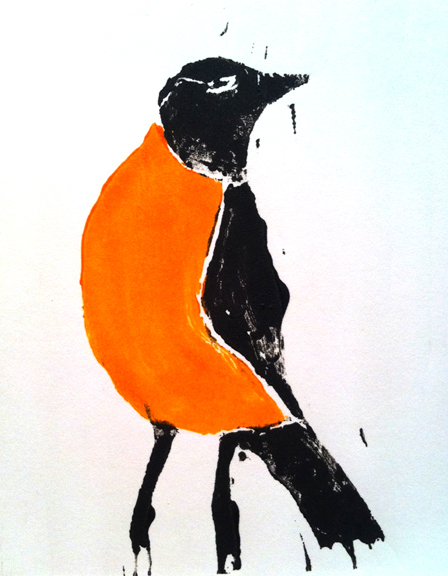 She recently opened Moody Road Studios with her husband, artist Mark Milroy, in Honesdale, PA. They hope you come and visit!